Get paid to travel to the world’s most beautiful places to talk makeup and fashion. As VP of Maybelline, Orrea Light lives that life. 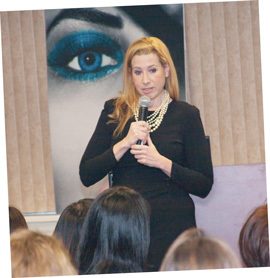 As a “trend expert,” her job sends her across the globe to watch movement in the beauty, fashion and textile industries, to predict how they will impact future trends in makeup and cosmetics. Orrea feels that any job can bring you around the world, if you play your cards right. Instead of focusing on a career that normally has a lot of travel, take any field you want to work in and look at it from a global perspective. Her work with Maybelline takes Orrea overseas for “eight big trips, five smaller trips jotted in-between,” per year. That’s a lot of airports and lineups. As an experienced traveller who has battled language and cultural barriers in stops like Moscow, Paris and Milan, she has a few tips on how to travel wisely. To navigate her way through France and Italy, Orrea has learned a bit of French and always tries to know a few important phrases in the language of her destination. Even if you’re terrible, she says, locals always appreciate the effort of trying to speak their language. And don’t worry. She’s more than happy to share her favourite must-see spots with you too. Orrea also feels that it’s important to immerse yourself in the local culture, as deeply as you can, and experience everything. Even though her schedule keeps her busy while she’s away on business, she makes every effort to squeeze some pleasure in. A lot of jobs involve a good deal of globe-trotting, so if travel is your thing, consider pursuing one of these great gigs for a way to see the world—and make work pay for it! Evaluate the cleanliness and service of hotels around the world in amazing tourist locations, while you receive VIP treatment at luxurious hotels. As you ensure all standards are met, you may try out the hotel’s gym, bar, spa and restaurant. Travel to an exotic country to teach locals the English language while learning about their culture (and possibly their language) in return. It will be a great experience to live and work in an unfamiliar environment and meet fellow teachers from all over the world. Perform your original jokes in front of live audiences, in hopes of garnering immediate laughs. Start off entertaining at open mic events in bars and small clubs and as you gain more success, you’ll graduate to performing at national, then international shows. Scout players around the world to recruit for professional athletic teams. You’ll also have to travel to meet your prospects personally, and to attend workshops and training camps. If you work for an organization that has national or international offices, you will be required to travel to multiple places to maintain technological systems as well as to ensure the proper functioning of systems and services. You will also oversee staff, projects or enhancements.